It's been 5 weeks since I had my baby and I'm feeling really good. Much better than a month ago, and I'm looking forward to feeling like my old self again. Unfortunately, with a c-section you can't workout for 8 weeks, so as much as I'd like to start working on getting my old body back, I can't yet. This is why I'm still searching through my closet to find some comfortable clothes to dress my post baby body. I've been mostly wearing the same clothes that I wore while I was pregnant. I'm sticking with loose fitting and stretchy clothes. I'm still afraid to wear jeans, mostly because I'm afraid of them rubbing up against my incision, but maybe I'll be brave enough to try on a pair by next week. For now I'm sticking with comfy clothes. On Sunday, I wore this striped dress from H&M (original post) that I bought while I was pregnant. I knew when I bought it that I'd be able to wear it while I was pregnant and well after. It's not great for nursing, but that's okay because I only wore it to church. However it fits loosely around my belly which is really nice. 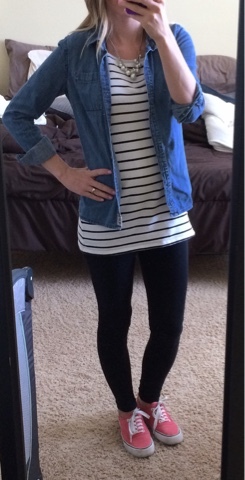 On Monday I wore this tunic top that I wore a lot while I was pregnant (older post) with leggings. I've been pretty much living in my leggings lately. We went out for dinner on Monday, so I wore my bubble necklace while we were out, but when I'm just at home I've been avoiding big jewelry with my little guy grabbing it all the time. On Wednesday, I wore a casual outfit with my striped top that I wore pretty much all the time during my pregnancy, because it fit perfectly. Now it's pretty loose, but it fits nicely over my belly band that I'm still wearing. I also decided to pull out my pink tennis shoes to add some color. Those are just a few of my looks from the week. I hope you enjoyed!